Welcome to our website. When the volunteers formed the fire department in 1955 the primary method of communication during a risk of fire was word of mouth and gathering at social and community functions, fundraising barbecues, and bake sales. We have come a long way in our history of the department and, while we still enjoy gathering at social and community functions, we have enhanced our website as an avenue to communicate with and educate the citizens of the community. Please take a few minutes and learn more about our Operations, Firefighter Training, Kids Safety, Preparedness, Community Outreach Initiatives, Share Your Story, and much more. We invite you to read more about Fire Chief Ron Moellenberg and Assistant Chief of Operations Nick Perkins. Combined, our Chiefs have over 60 years of experience and expertise in emergency medical and fire response and hold some of the highest levels of credentials in the industry. Serving as the first full-time fire chief since 1986, Chief Ron Moellenberg has been a leader in the Pflugerville community with a dedication to pursuing excellence in the service provided by Travis County ESD No. 2 / Pflugerville Fire Department. Chief Moellenberg attended Tarleton State University for two years before enlisting in the U.S. Army. After he was discharged from active duty, he completed his bachelor’s degree in Bio-Medical Science at Texas A&M University in 1975. After working in West Texas for the Texas Department of Health – Immunization Division, he transferred to the Austin office in 1977. While employed with the Texas Department of Health, he was responsible for the development, coordination, and management of rash-fever illness surveillance and measles control in the state and had several related articles published, including an article in the New England Journal of Medicine. While working for the Texas Department of Health in Austin, Chief Moellenberg began to forge a new career path in the fire services industry when he joined the Pflugerville Volunteer Fire Department. He worked in administrative positions as well as through the ranks before being elected to the Volunteer Fire Chief position. In 1986 he left the Texas Department of Health to become a full-time Fire Chief. Since becoming Fire Chief, Chief Moellenberg has led the transition from an all-volunteer service organization to a combination of volunteer and paid service to now a career department with uniformed personnel and civilian staff members. Chief Moellenberg introduced Compressed Air Foam (CAF) Technology as a means to effectively use personnel resources, improve fire suppression to reduce property loss, and to conserve valuable water resources. He worked with the Texas State Legislature to approve legislation to give insurance credit to homeowners in communities that use CAF Technology. 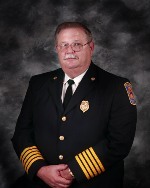 In addition to being a leader within the Pflugerville community, including previously serving as Alderman on the City Council, Chief Moellenberg has served as an officer on numerous international, national, state and county fire industry associations. He is also an honorary member of the British Fire Services Association. Additionally, Chief Moellenberg lends his expertise and serves as a Command Officer for the Capital Area Hazardous Materials Advisory Board and is one of five area coordinators for emergency resources for any and all disasters. Assistant Chief of Operations Nick Perkins joined the District in 1998. During his 20 year career with the District he has risen through the ranks becoming a Chief Officer in 2011. He has worked as a Shift Commander and as the Training Division Chief before being appointed as the Assistant Chief of Operations. Chief Perkins graduated from the San Antonio College Fire Academy in 1997, and went on to work on an ambulance for a rural EMS system before joining the District. He has earned an Associates Degree in fire protection technology from Austin Community College in 2001, a Bachelor of Applied Arts and Sciences Degree from Texas State University in 2013, and a Master of Public Administration Degree from the University of Texas at Rio Grande in 2018. Chief Perkins has managed multiple high profile incidents, including multi-alarm fires throughout his career. He has a history of developing industry leading community, training, health, and safety programs. He has established and taught fire protection technology programs in central Texas high schools and at the collegiate level.